(Seychelles News Agency) - Seychelles will soon activate a Regional Operation Coordination Centre to deal with maritime crimes, local authorities said. Rosette did not reveal other details about the centre. 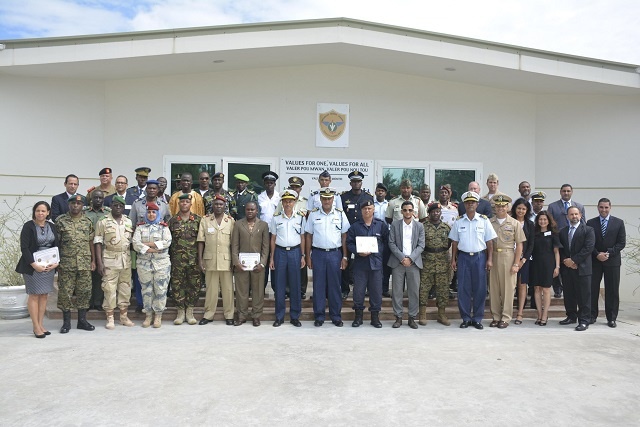 The announcement came at the end of a one-week trans-regional seminar hosted by the Seychelles Coast Guard in which 30 participants from several countries met to discuss ways to combat terrorism and violent extremism using non-violent methods. The course coordinator, retired United States army officer Carlos Burgos, said it was important to take a strategic approach to deal with the issue of terrorism as this would allow participants to look at larger issues across their whole country. “It’s not about combating terrorism with arms but rather combating it through social and political programmes,” said Burgos, who is from the US Joint Special Operations University (JSOU), in Florida. Seychelles has suffered economic fallout from past attacks from Somali pirates in the region. The island nation has not been a target for terrorism. “Through our experience in dealing with maritime piracy, we have been able to appreciate the result of good coordination and collaborative efforts of like-minded partners with a common goal,” Rosette said. One of the participants from Seychelles People’s Defence Forces, Vincent Luther, told SNA that although the island nation is yet to face a terrorist act, it is important that the country prepares itself for any eventuality. “If Seychelles comes across intelligence on a possible attack we will be in a better position now to liaise directly with the country involved and alert them and avert an attack, thus saving lives,” said Luther. He added that following the session a new network has been created, where countries will be able to share information about any possible threat. The one-week trans-regional seminar was organised by the American Joint Special Operations University (JSOU), the Defense Combating Terrorism Fellowship Program (CTFP) and the United States Embassy.